The word ‘geography’ is derived from two words, ‘geo’ and ‘graphy’, in which geo comes from Greek word ‘ge’ which means ‘Earth’ and ‘graphy’ comes from ‘graphein’ which means ‘to describe’. So, geography means “description of the Earth’s surface”. It is the study of the earth and its features and of the distribution of life on the earth, including human life and the effects of human activity. As geography is a subject which needs to be studied in depth, so it is difficult to teach all of it. There are many students who are curious to know more and more information and can’t stay away from all things related to geography. So if you are one of those who is curious to collect or grab more and more information or not much interested in it then, to help yourself as a teacher you can use the apps listed below which will not only provide the knowledge or develop interest but also make it enjoyable for them too. This app is to increase your knowledge about the countries of the world, their capitals, languages, population, GDPs, flags and more. Find specific countries from the lot using the interactive map, search or the index. A distinctive feature of audio is also there to help you with the quiz mode. 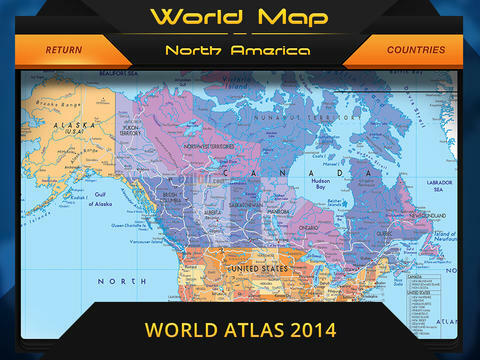 World Map Atlas provides the information about countries in the world. Things which you can learn from this app are the country flag, currency, international telephone code, location in the map, languages were spoken, economy, borders, and continent. As its name suggests, it is a proper quiz game with a 3D effect and as you progress by giving correct answers you get to race around the world with other players including Facebook friends. The questions asked are about the countries, languages, capital, major cities, landmarks, rivers etc. It is an addictive app. In this app, you can combine word search, jigsaw & trivia to solve puzzles and explore the world in an engaging manner. These puzzles are a type of crossword that enables students to learn geography. This app highlights themes like animals, travel, planet Earth, humanity, and science. 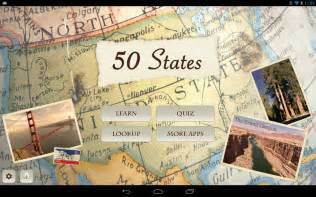 It is about the US, as the name suggests, this app lets you learn various things about the 50 states of US. You will find info about each state’s population, the flag, highest point, motto, and even the official state bird. You can also test your knowledge in quiz mode. It is a quiz game app. It will help you learn countries capital and flags of the world in a fun way. It is linked to Wikipedia from where you can learn more about it. The app is available in 4 languages: English, Polish, French, and Spanish. It starts with the training game to learn and then move to the challenge game to test what you have learned. Another quiz? Well yes! It is one of the best geography quiz apps. In this, you have to identify outlines of countries, states, provinces, territories, and regions. 200 outlines to identify divided into 10 challenging levels. It can really turn you into a map master. There are hundreds of places to guess and find, while Wikipedia interaction lets you discover more details about them. It offers several ways to play, including pinpoint, time attack, multiplayer and learns mode. It is a challenging game specifically designed for kids in grade 4-8. In this, the user gets to test them by answering the multiple-choice round from a library of more than 1000 national geographic questions, map challenge round from a catalog of 1000+ locations and bonus round to identify national geographic photographs and locate it on the map. In this app, you can fly to 3D cities and view the world at street level. This app enables the user to explore the world with the fingers. The app is having enhanced user-friendly interface. Most students often distance themselves from the subject like geography so to remove the distance these are some apps which will help you to increase your knowledge. Hope this article will help you.